Extensive faulting and erosion over time have produced a wide range of topographic features, making Sri Lanka one of the most scenic places in the world. Three zones are distinguishable by elevation: the Central Highlands, the plains, and the coastal belt (see fig. 3). The south-central part of Sri Lanka--the rugged Central Highlands--is the heart of the country. The core of this area is a high plateau, running north-south for approximately sixty-five kilometers. This area includes some of Sri Lanka's highest mountains. (Pidurutalagala is the highest at 2,524 meters.) At the plateau's southern end, mountain ranges stretch 50 kilometers to the west toward Adams Peak (2,243 meters) and 50 kilometers to the east toward Namunakuli (2,036 meters). Flanking the high central ridges are two lower plateaus. On the west is the Hatton Plateau, a deeply dissected series of ridges sloping downward toward the north. On the east, the Uva Basin consists of rolling hills covered with grasses, traversed by some deep valleys and gorges. To the north, separated from the main body of mountains and plateaus by broad valleys, lies the Knuckles Massif: steep escarpments, deep gorges, and peaks rising to more than 1,800 meters. South of Adams Peak lie the parallel ridges of the Rakwana Hills, with several peaks over 1,400 meters. The land descends from the Central Highlands to a series of escarpments and ledges at 400 to 500 meters above sea level before sloping down toward the coastal plains. 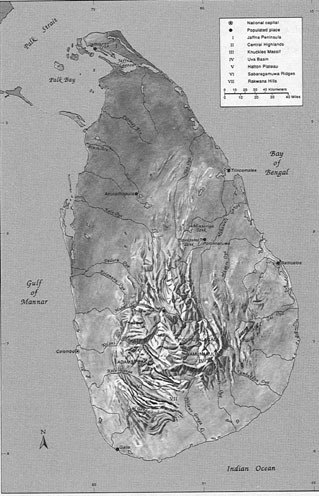 Sri Lanka's rivers rise in the Central Highlands and flow in a radial pattern toward the sea. Most of these rivers are short. There are sixteen principal rivers longer than 100 kilometers in length, with twelve of them carrying about 75 percent of the mean river discharge in the entire country. The longest rivers are the Mahaweli Ganga (335 kilometers) and the Aruvi Aru (170 kilometers). In the highlands, river courses are frequently broken by discontinuities in the terrain, and where they encounter escarpments, numerous waterfalls and rapids have eroded a passage. Once they reach the plain, the rivers slow down and the waters meander across flood plains and deltas. The upper reaches of the rivers are wild and usually unnavigable, and the lower reaches are prone to seasonal flooding. Human intervention has altered the flows of some rivers in order to create hydroelectric, irrigation, and transportation projects. In the north, east, and southeast, the rivers feed numerous artificial lakes or reservoirs (tanks) that store water during the dry season. During the 1970s and 1980s, large-scale projects dammed the Mahaweli Ganga and neighboring streams to create large lakes along their courses (see Agriculture , ch. 3). Several hundred kilometers of canals, most of which were built by the Dutch in the eighteenth century, link inland waterways in the southwestern part of Sri Lanka.